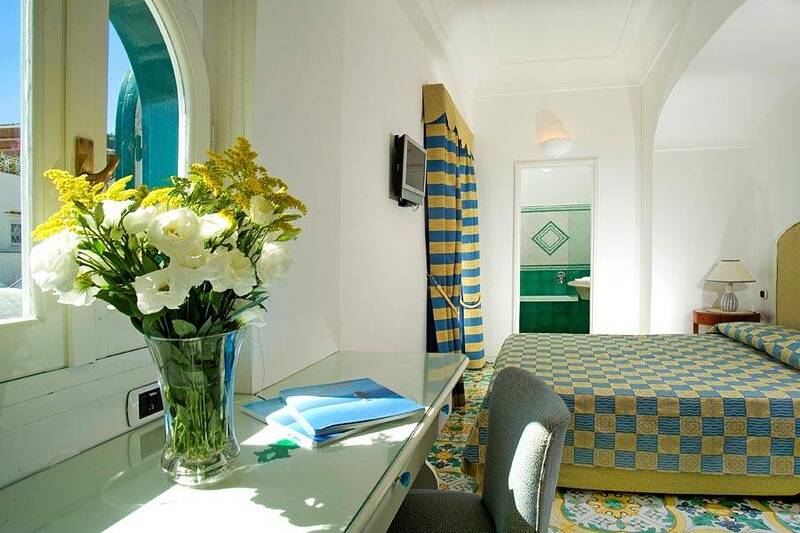 Gatto Bianco's tastefully decorated standard rooms look out over the hotel's pretty internal courtyard. 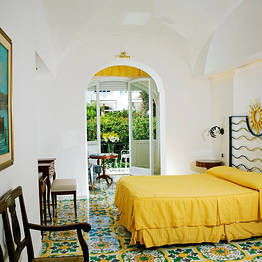 These are the only rooms in the hotel without a terrace. 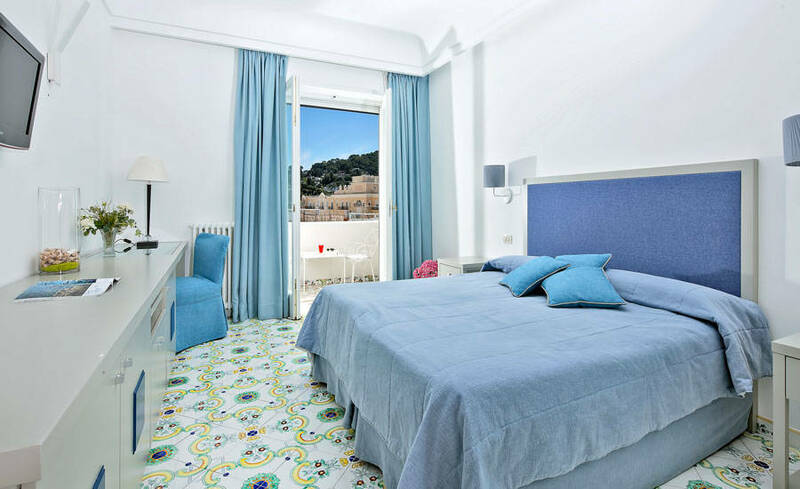 Furnished in typical Mediterranean style, superior rooms are decorated in soft pastel tones and open out onto a terrace overlooking the rooftops of Capri. 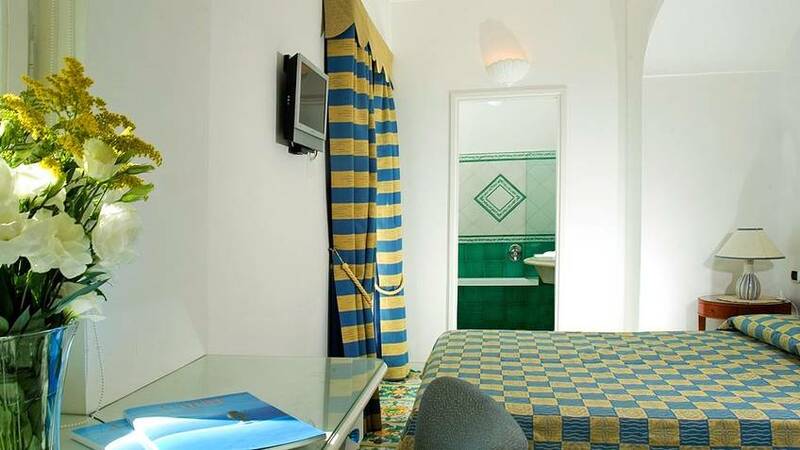 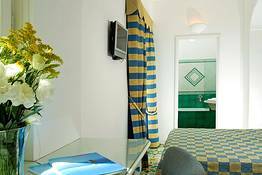 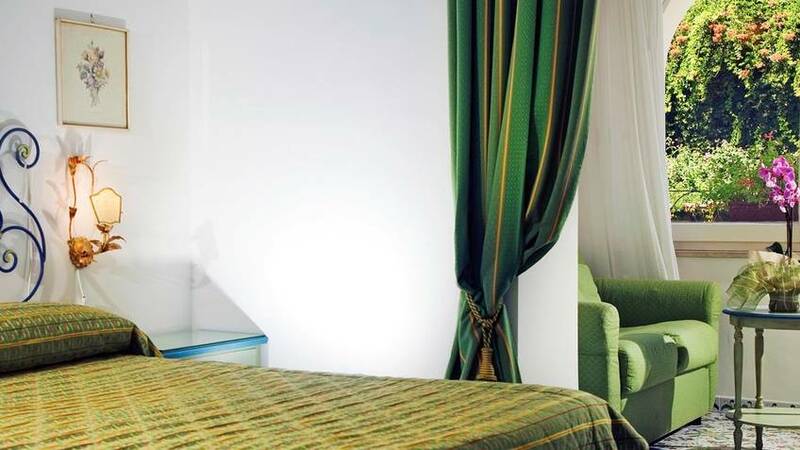 The hotel's spacious comfort rooms have a sitting corner and are large enough to comfortably accommodate a third bed. 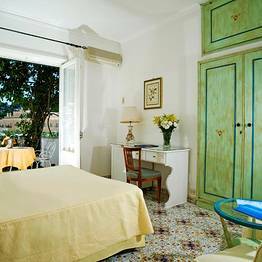 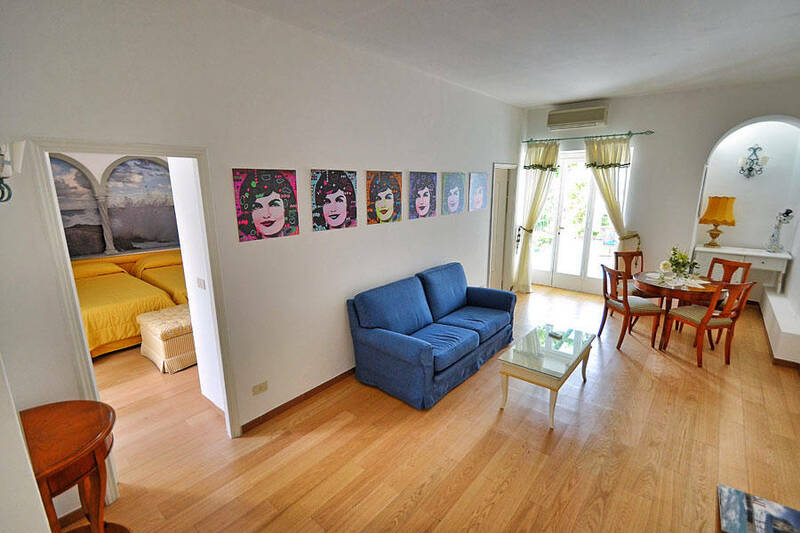 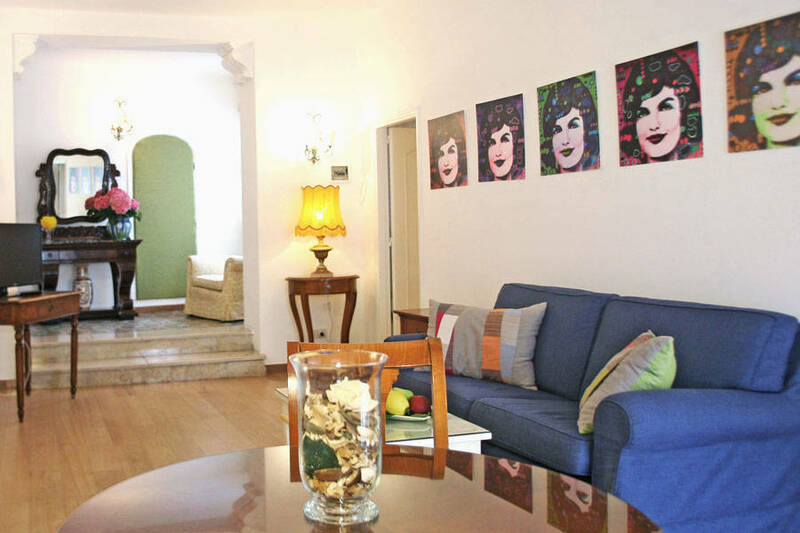 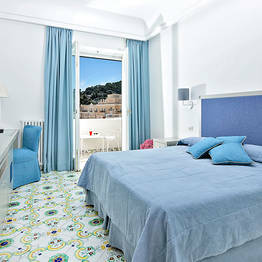 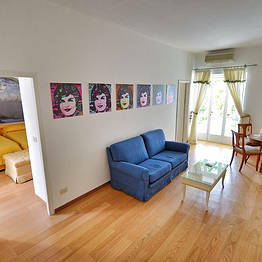 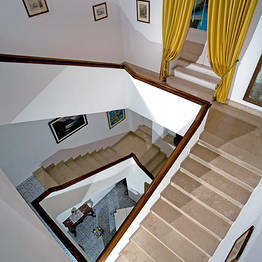 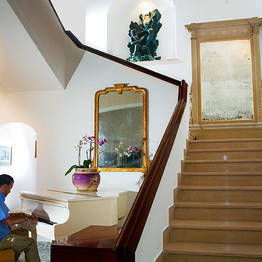 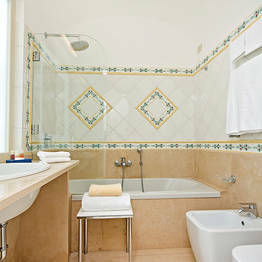 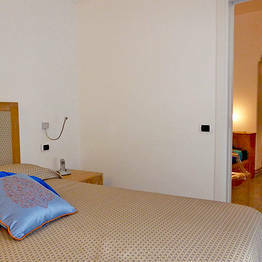 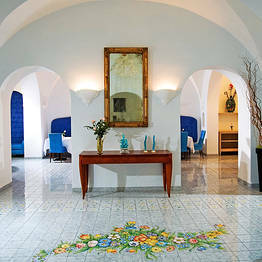 Furnished in classic Mediterranean style all rooms have a terrace lwith a view of one of Capri's typical citrus groves. 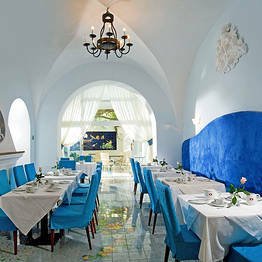 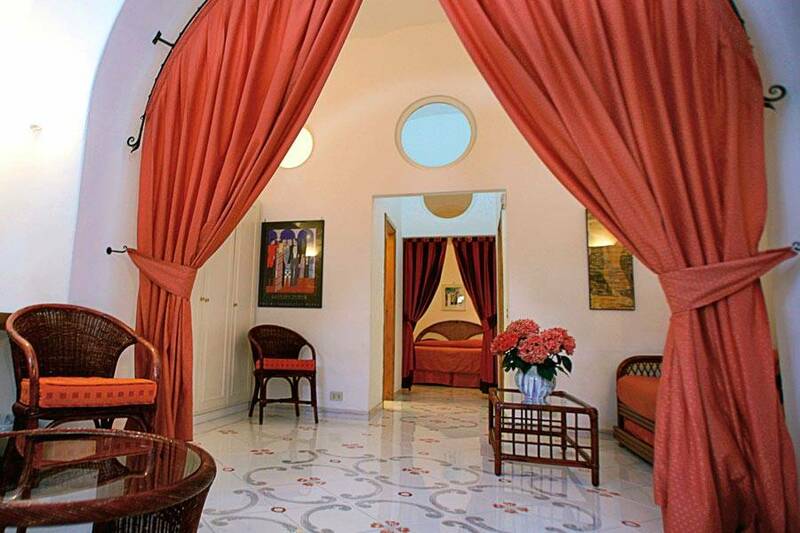 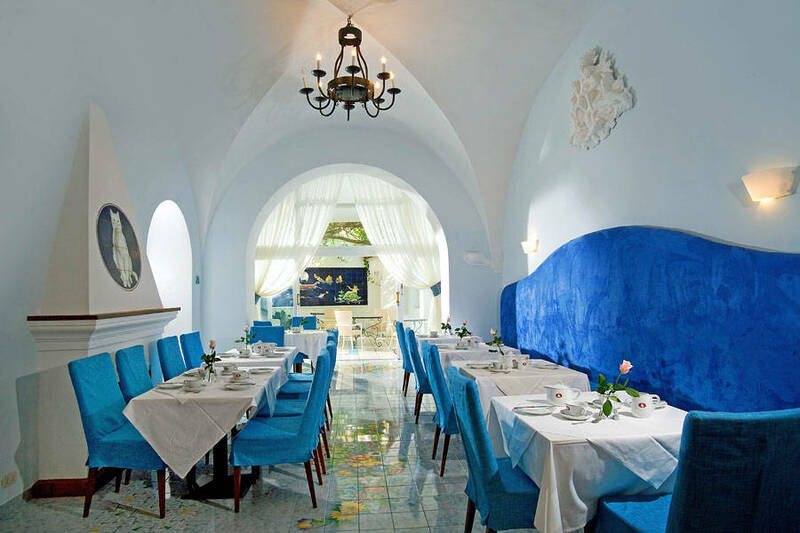 Gatto Bianco Hotel & Spa is one of Capri's oldest hotels. 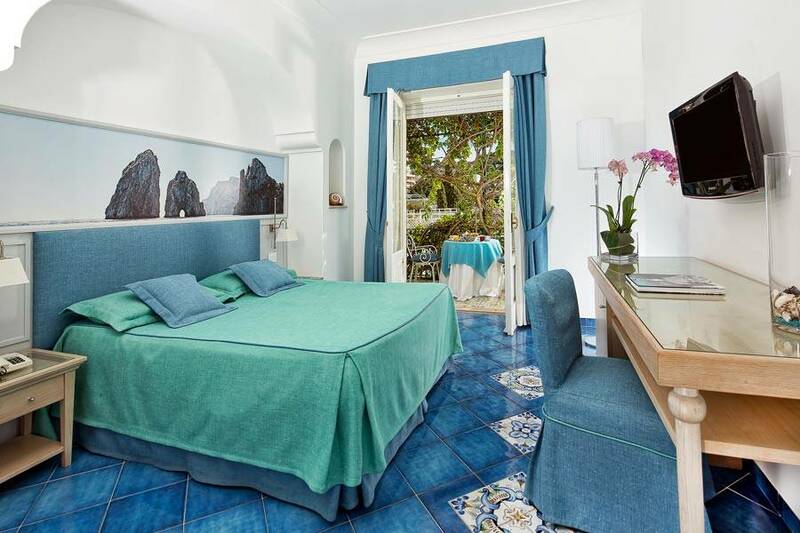 Via Vittorio Emanuele, the street lined with luxury boutiques and fashionable bars and restaurants and in which the hotel is situated, is the heart of Capri. 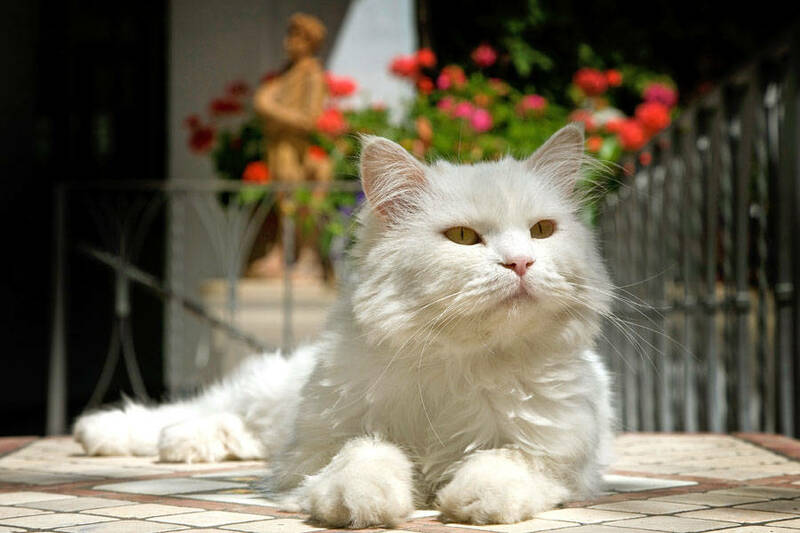 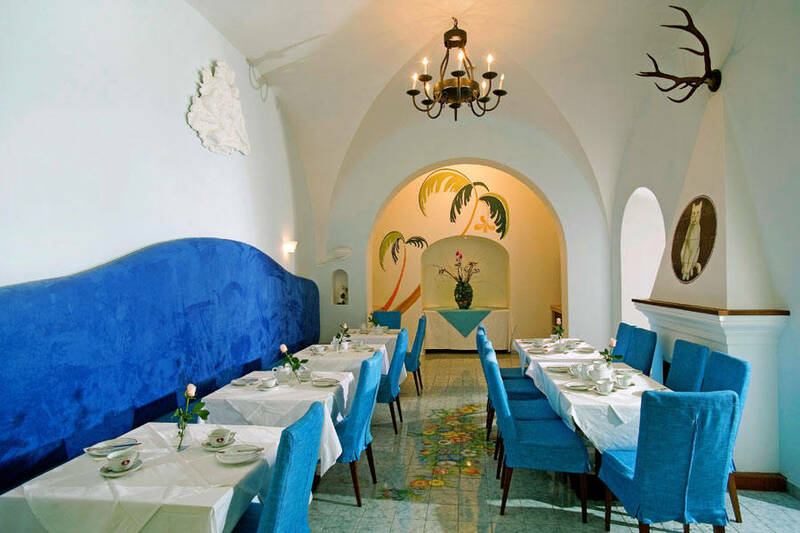 The origins of the Gatto Bianco date back to the mid 1800's, when Carmela Esposito opened an inn so as to offer hospitality to visitors to the island. 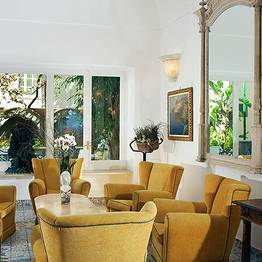 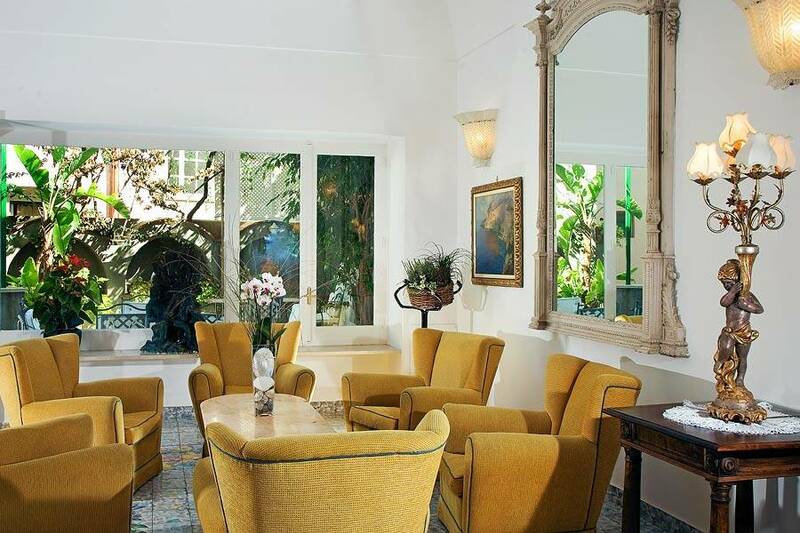 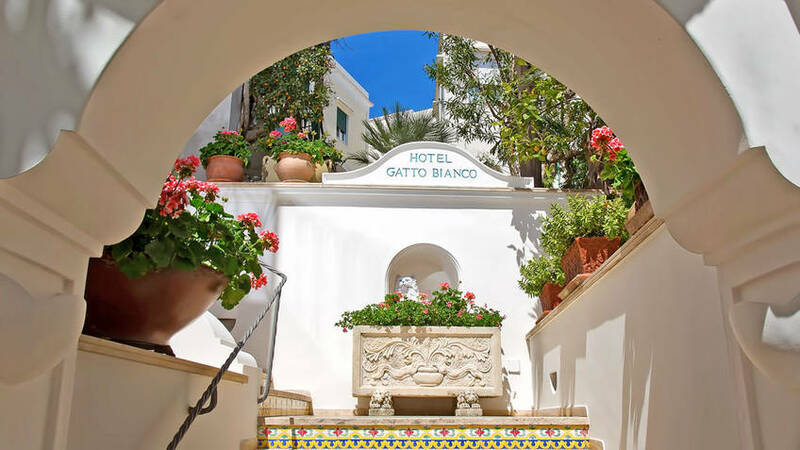 Among the illustrious personages to have stayed at the Gatto Bianco, we find King Farouk, Jack Lemmon, Clark Gable, Jacqueline Kennedy, Sofia Loren and Brigitte Bardot. 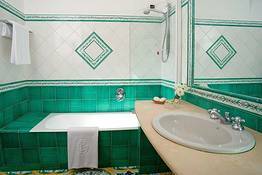 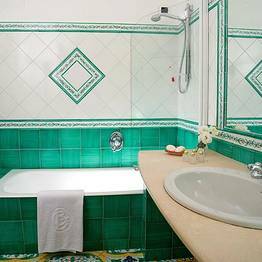 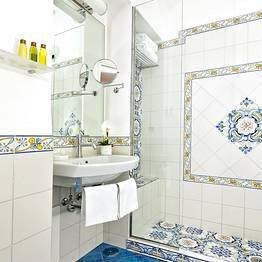 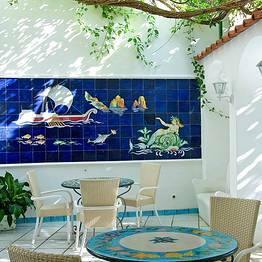 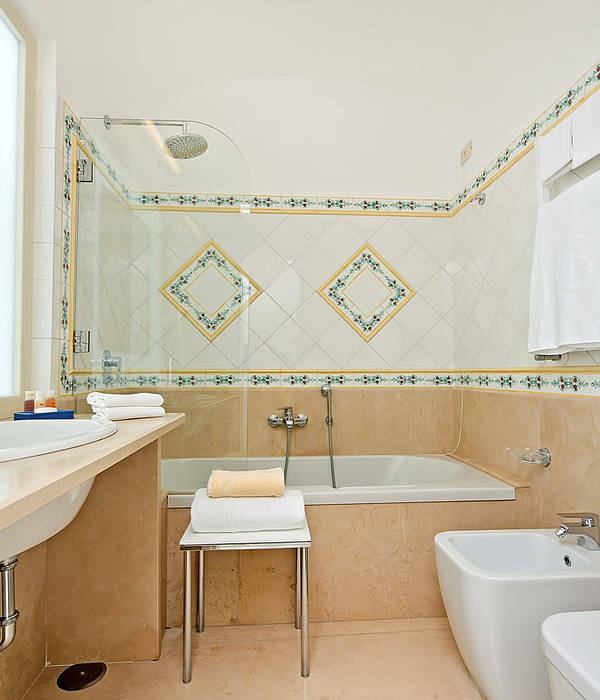 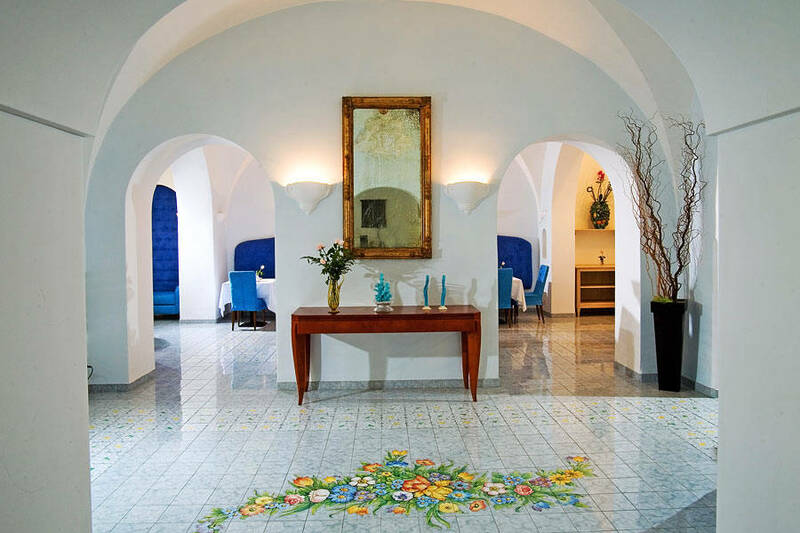 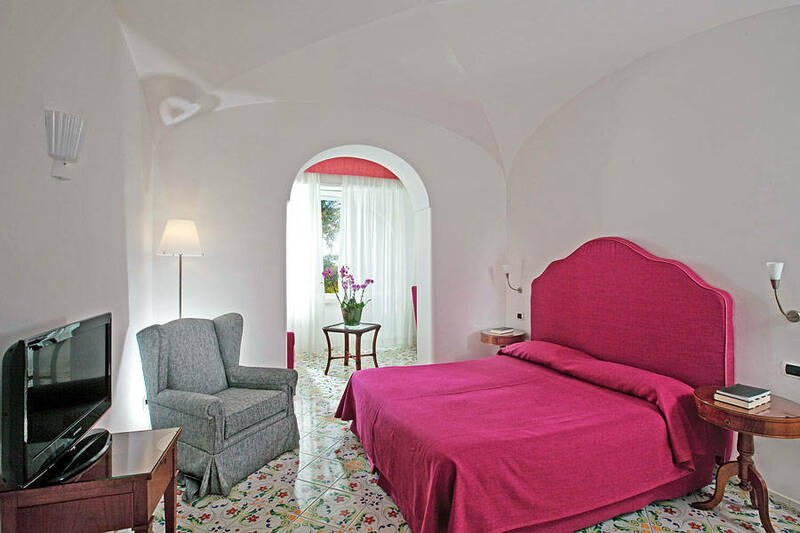 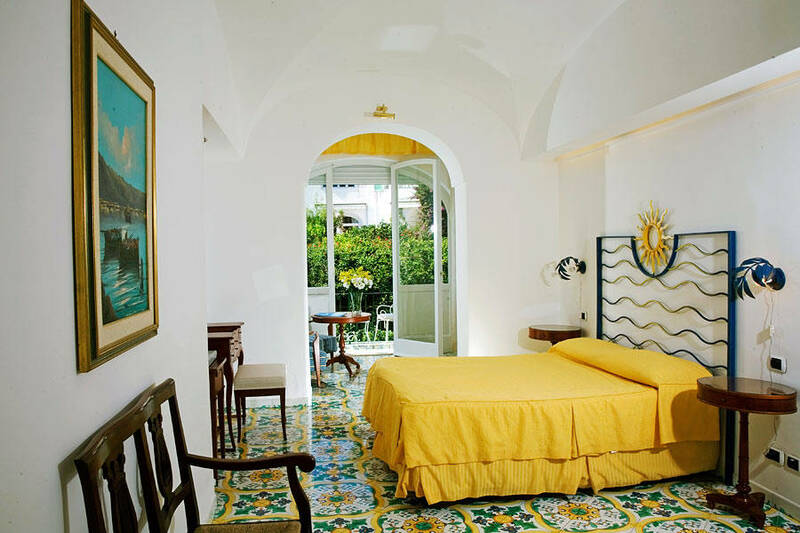 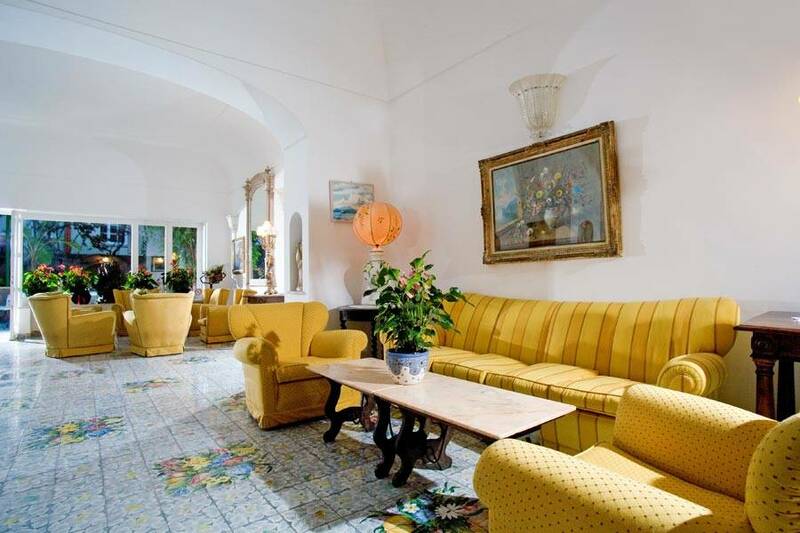 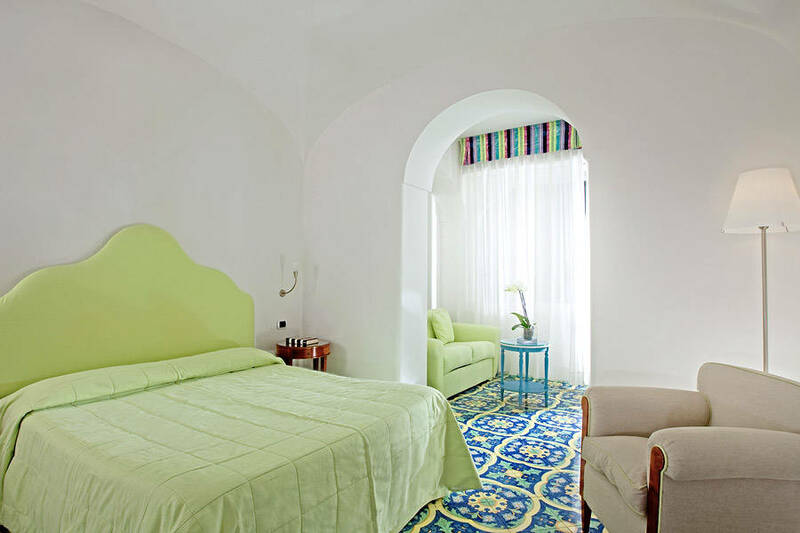 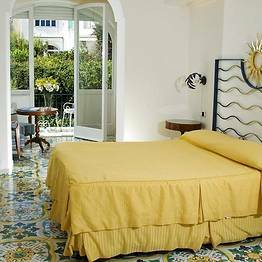 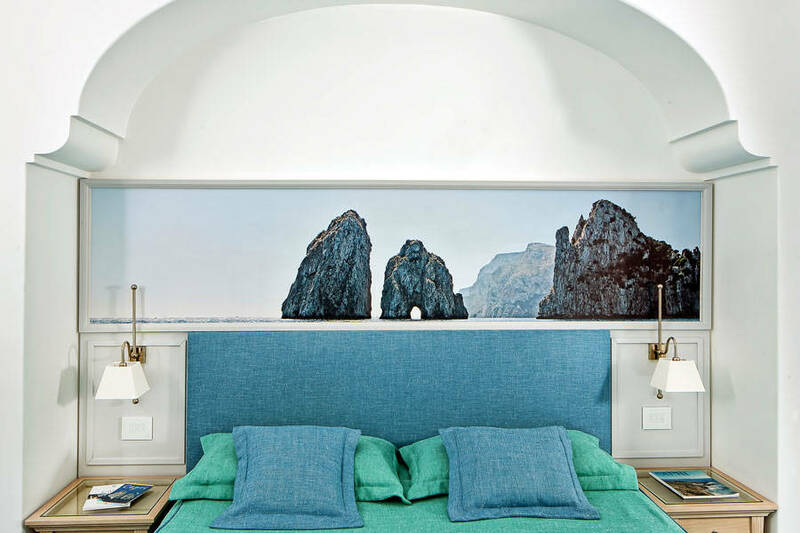 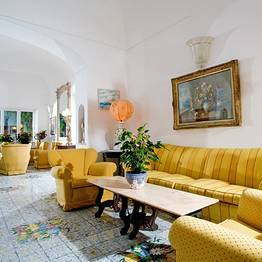 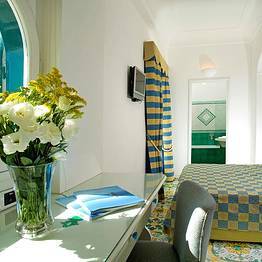 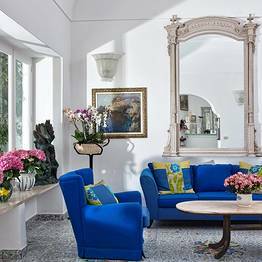 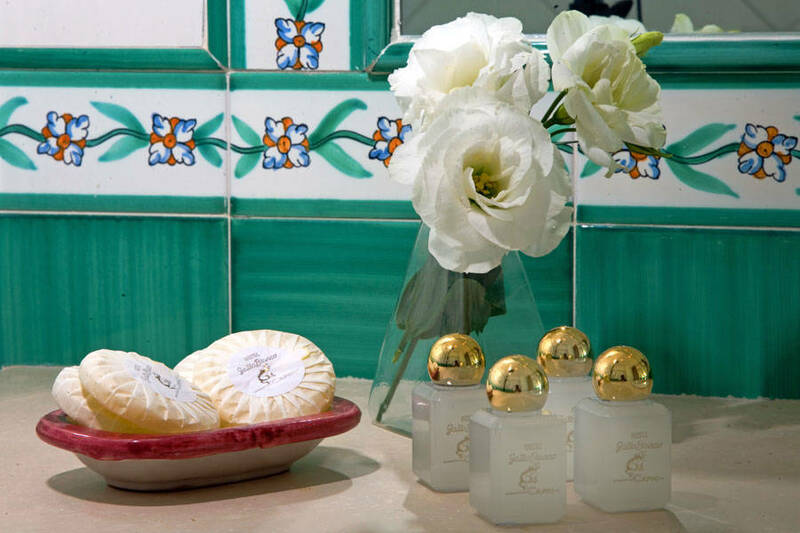 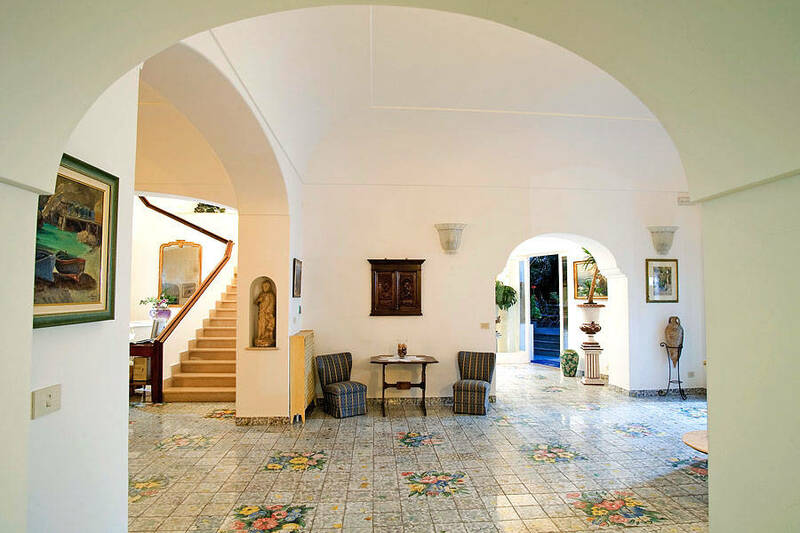 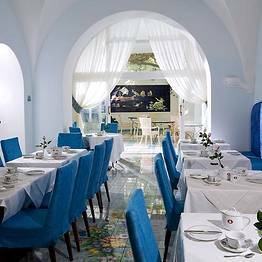 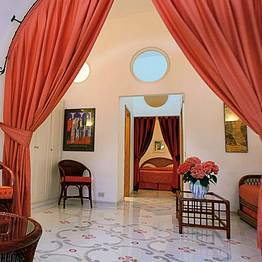 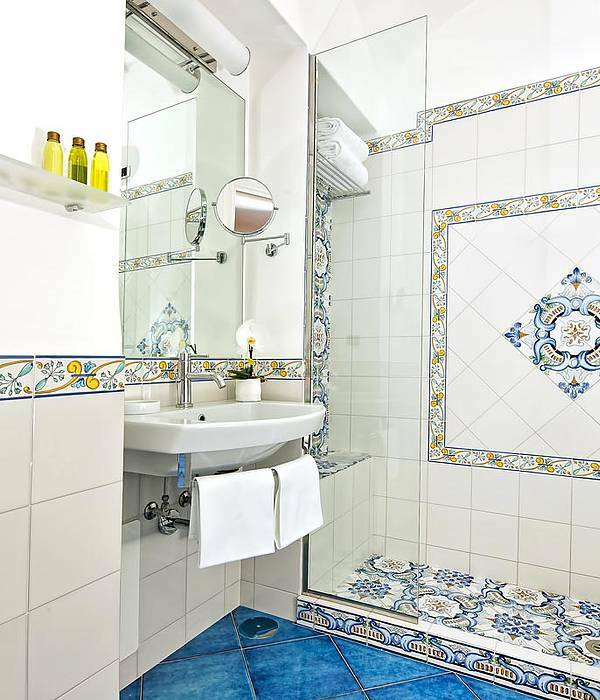 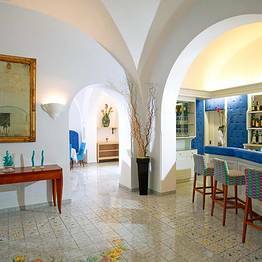 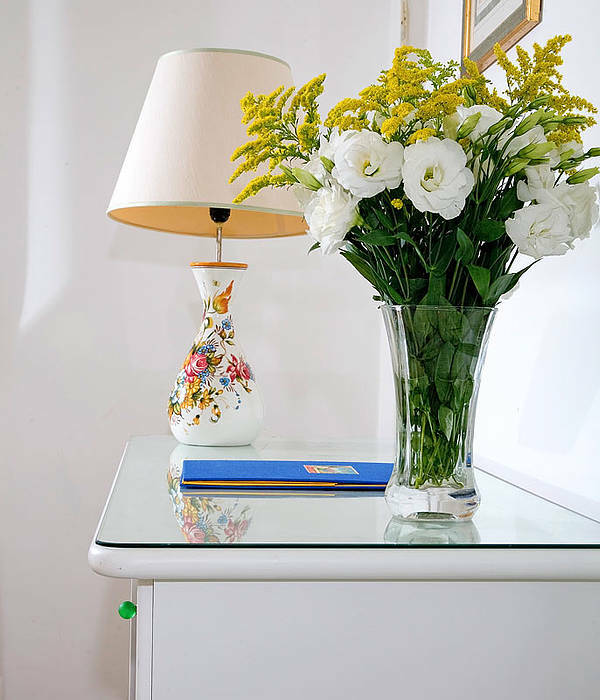 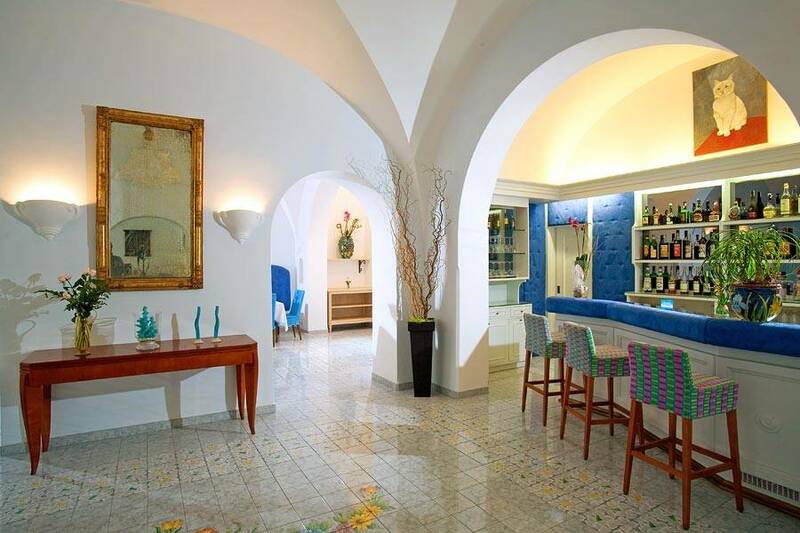 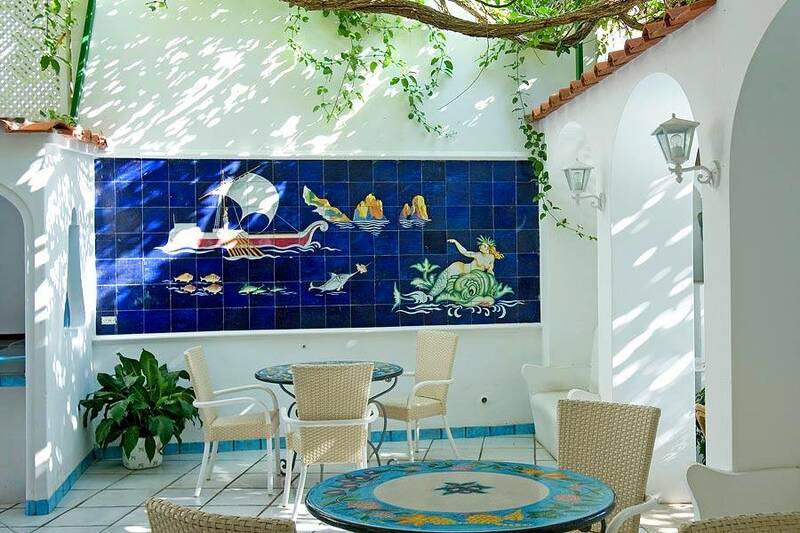 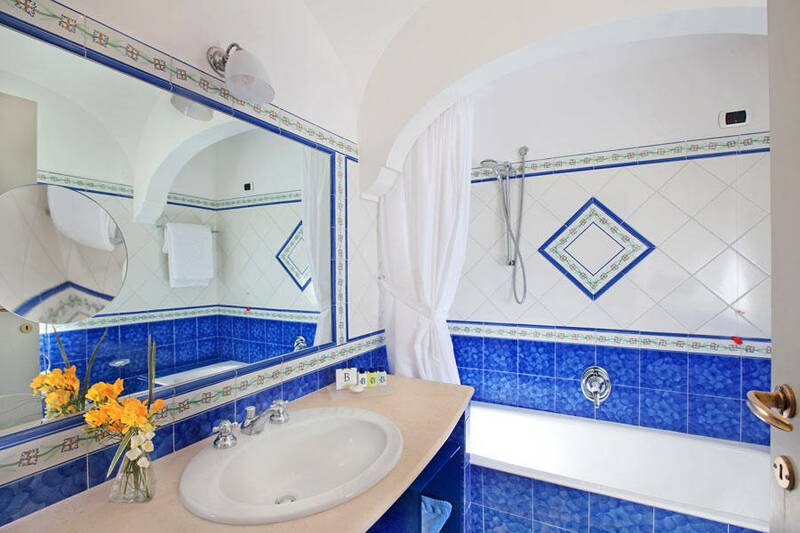 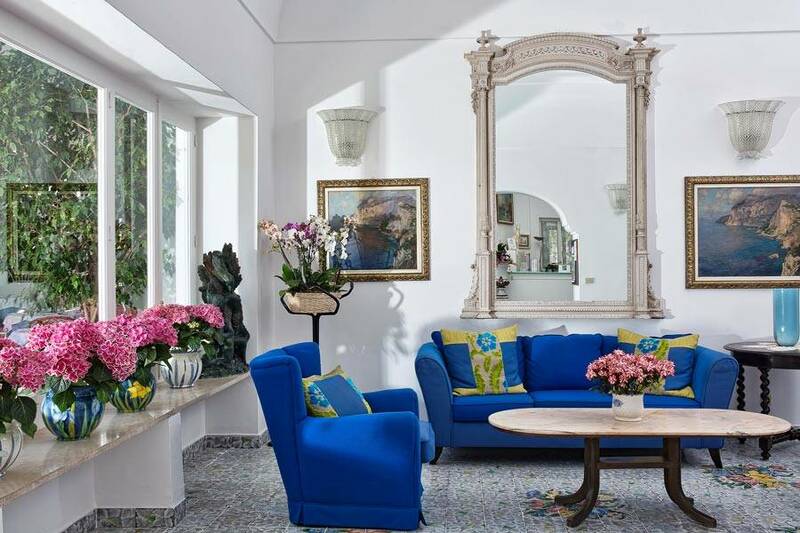 Hotel Gatto Bianco boasts all the most appealing elements traditionally found in the architecture of Capri: its spacious, light filled rooms featuring wonderful vaulted ceilings and floors paved in exquisite majolica tiles. 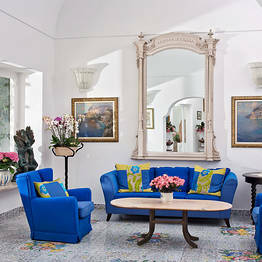 Furnishings are both elegant and functional, so as to offer the maximum in contemporary comfort. 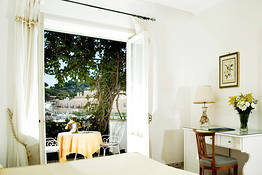 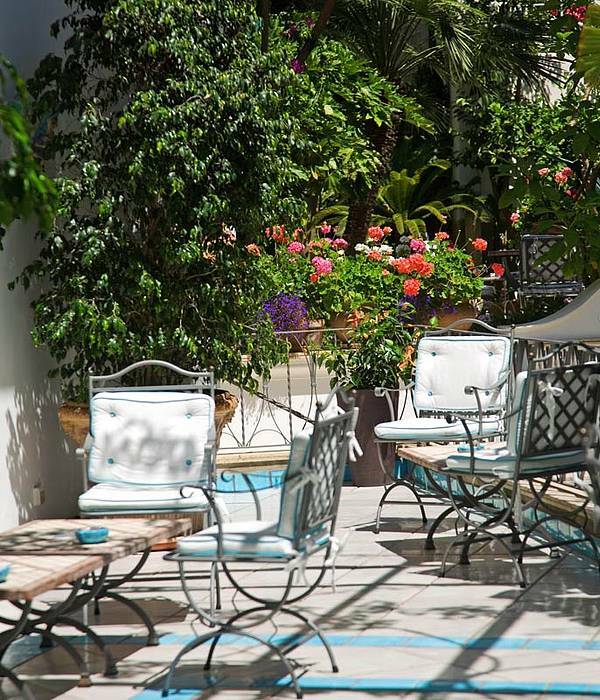 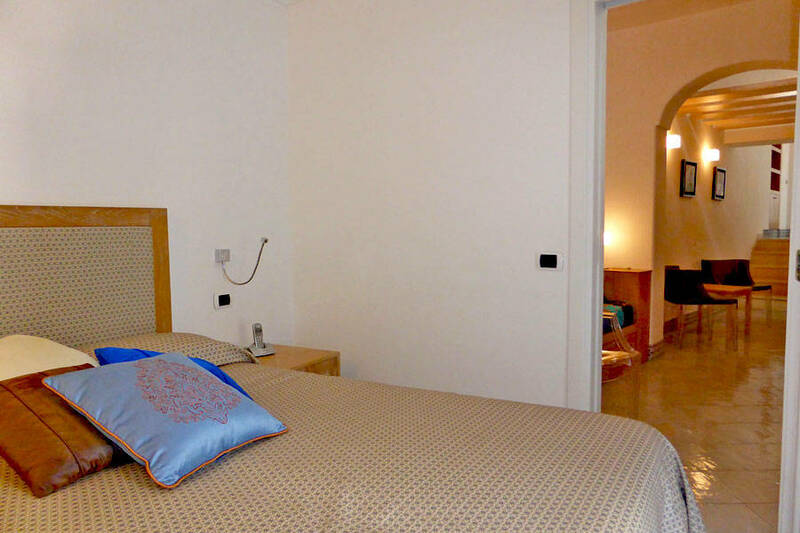 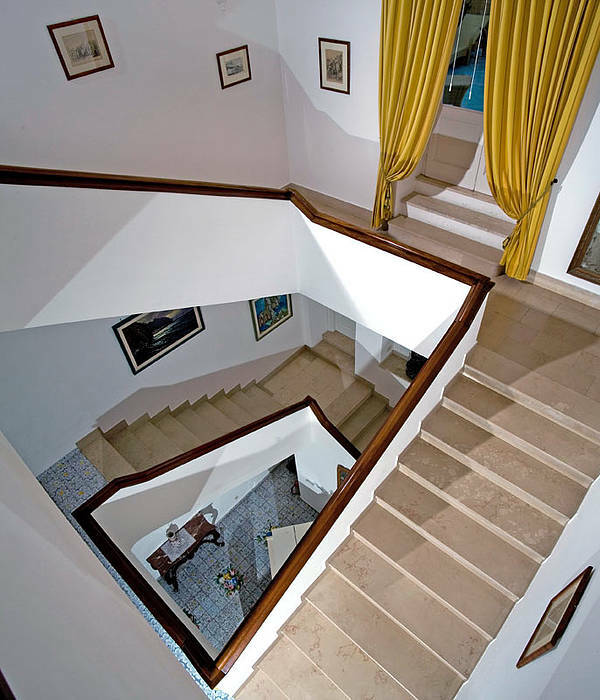 Bedrooms open out on to delightful little terraces overlooking the garden and the roof tops of Capri. 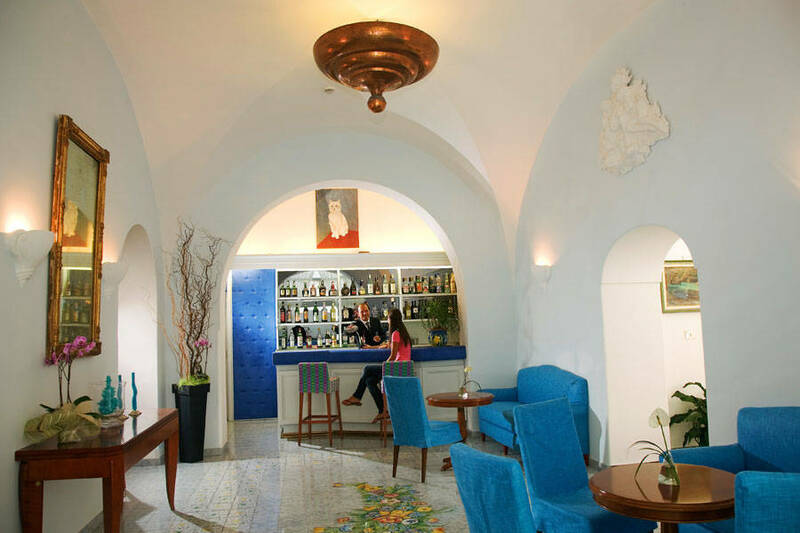 The lounge and the flower decked terraces are the perfect places where to relax in the company of family or friends, whilst sipping a drink or cocktail from the bar. 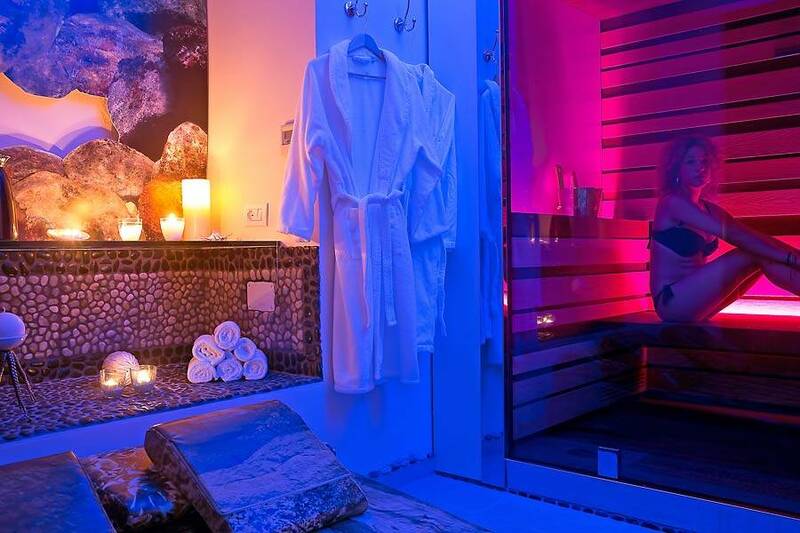 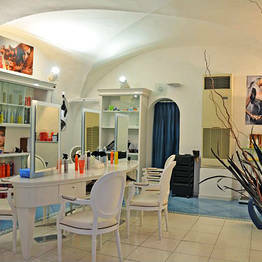 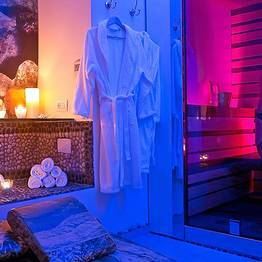 The hotel has also beauty center, the Gatto Bianco Wellness & Spa. 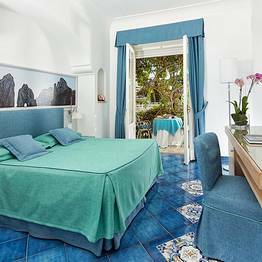 "You couldn't ask for a better location: bang in the center of Capri and within walking distance of all the major attractions. " 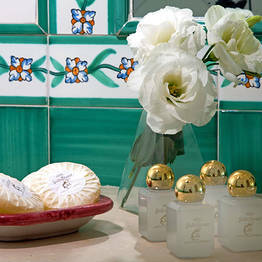 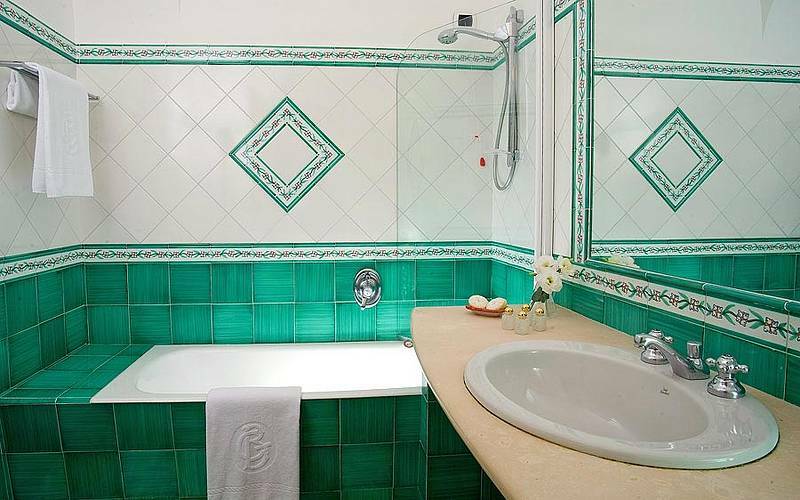 "The building is really well maintained: the majolica tiled floors are particularly beautiful ." 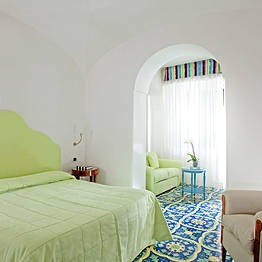 "The hotel is really peaceful despite being right in the center of town. " 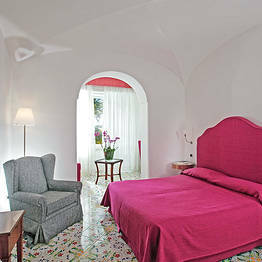 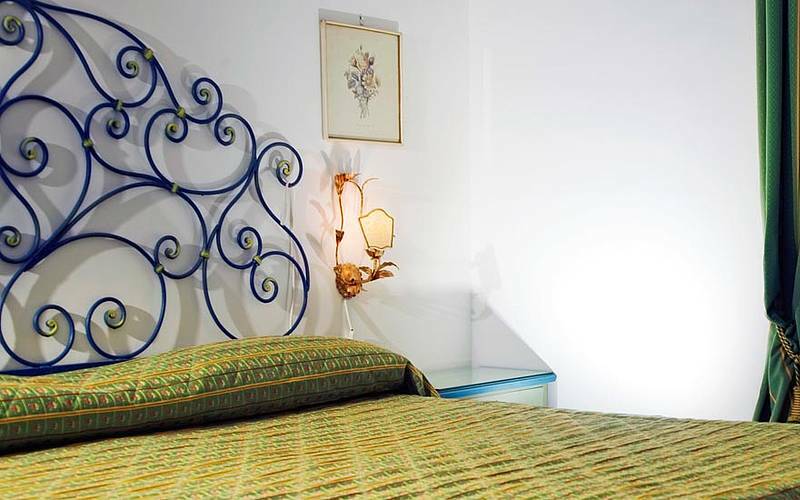 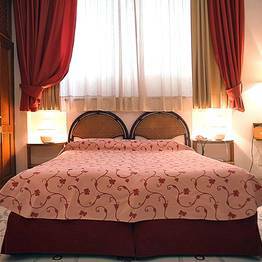 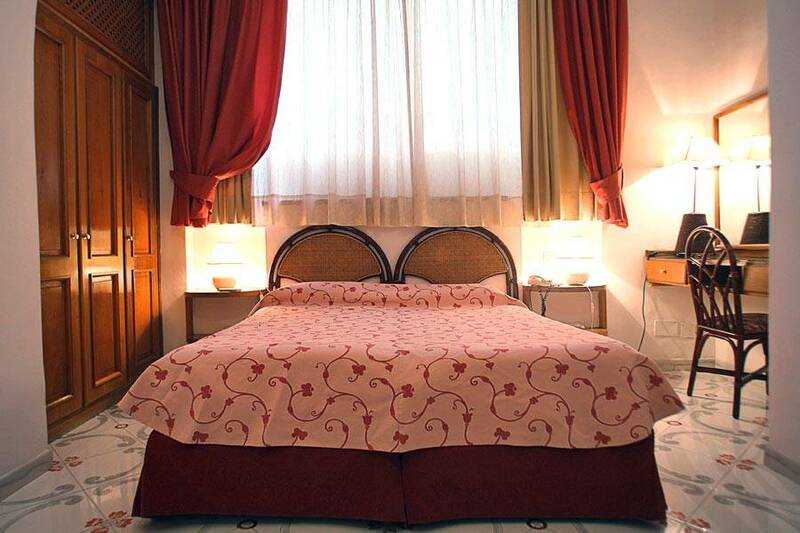 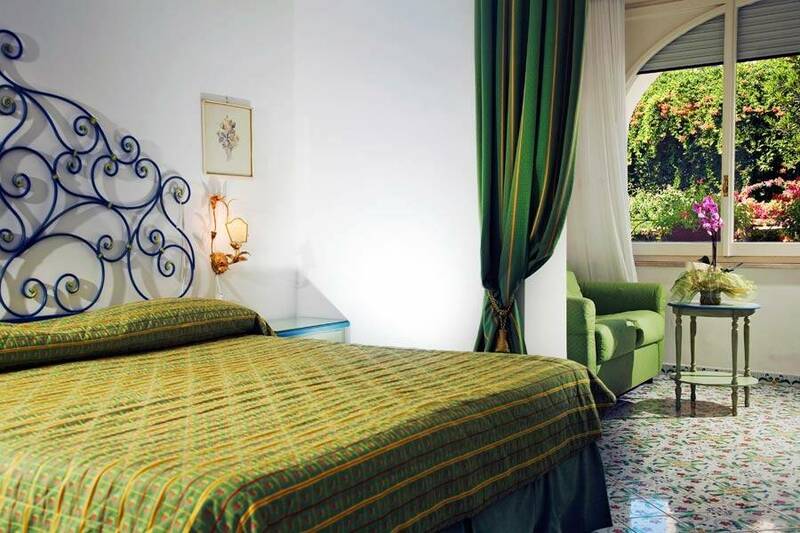 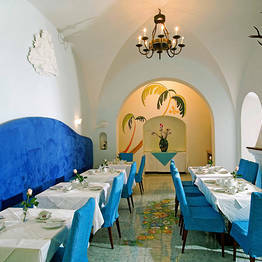 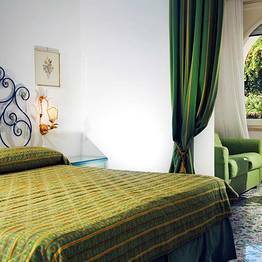 "The hotel is furnished in typical Capri style and is ideal for a romantic escape. " 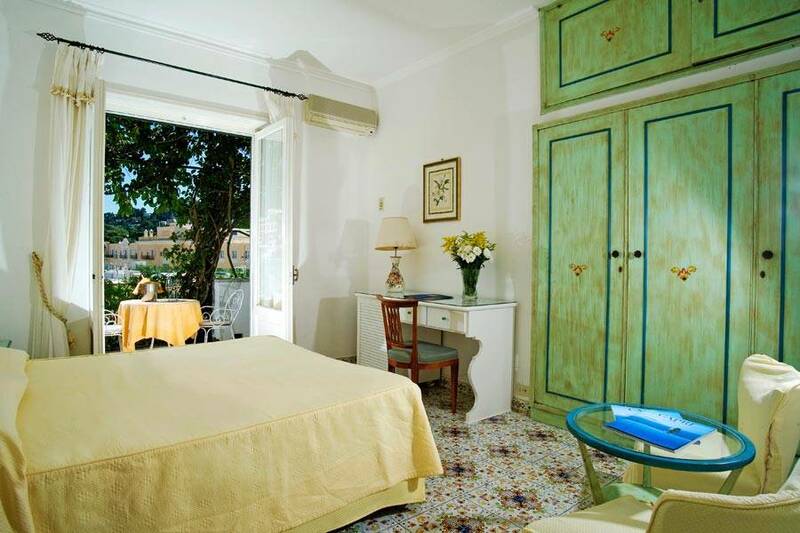 "Bedrooms are spacious, tastefully furnished and open out onto charming terraces. " 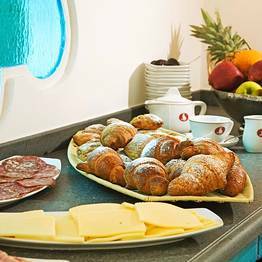 "Excellent breakfast of homemade pastries and cakes." 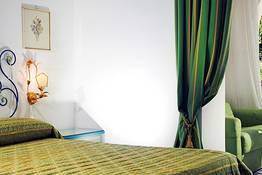 "We enjoyed our vacation tremendously. 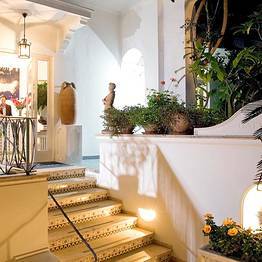 The location of the hotel is excellent right in the heart of the shopping district hich put some strain on my credit cad. " "Staff was very knowledgeable and helpful. " 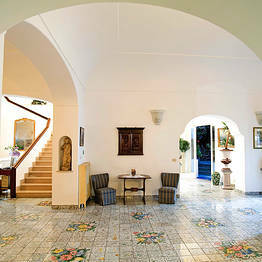 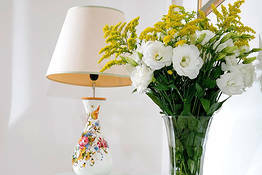 "The staff are very welcoming and nice, feels like a family oriented hotel. 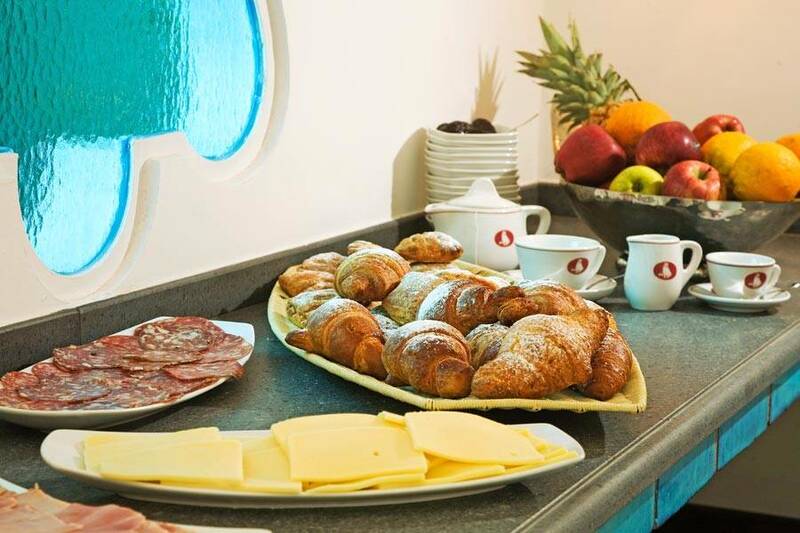 The only thing was disappointing was the breakfast which consists only some pastries and juices no cheese or eggs. " 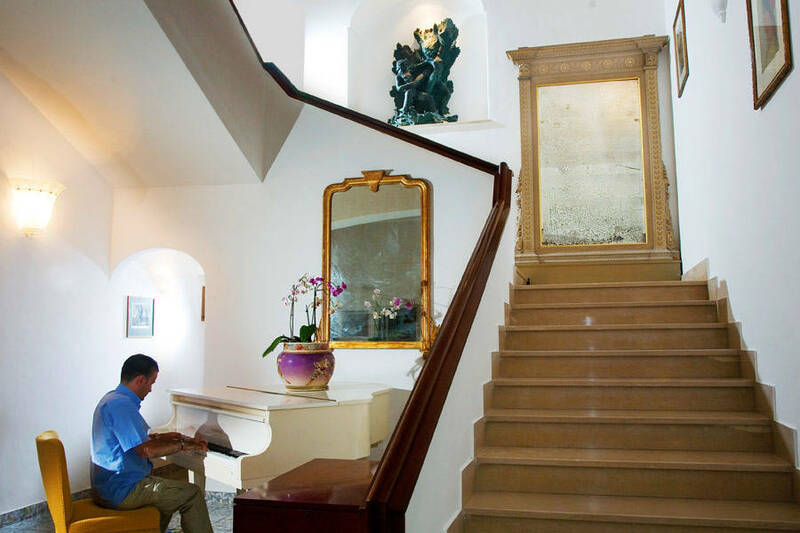 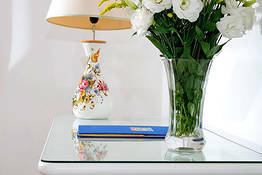 "While several of the staff and reception attendees were very nice and helpful, a couple of others were not friendly at all and offered us no information when we checked in." 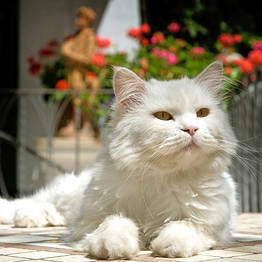 ...complete with the white cat! 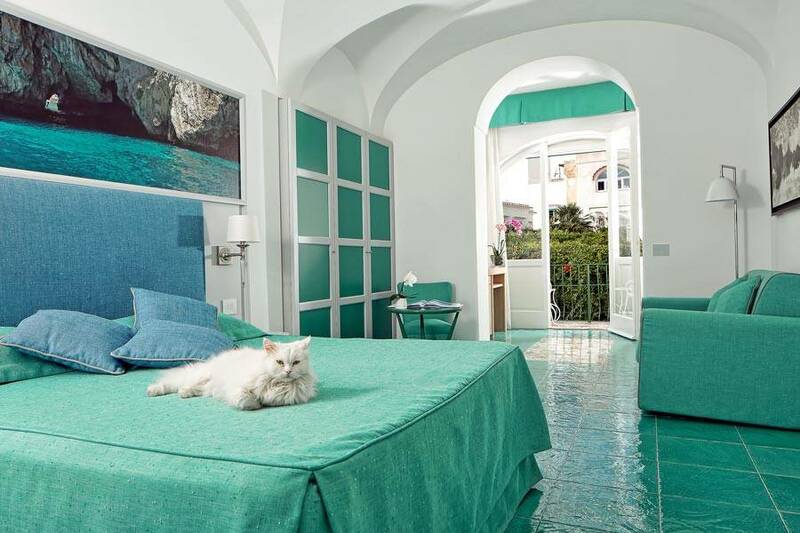 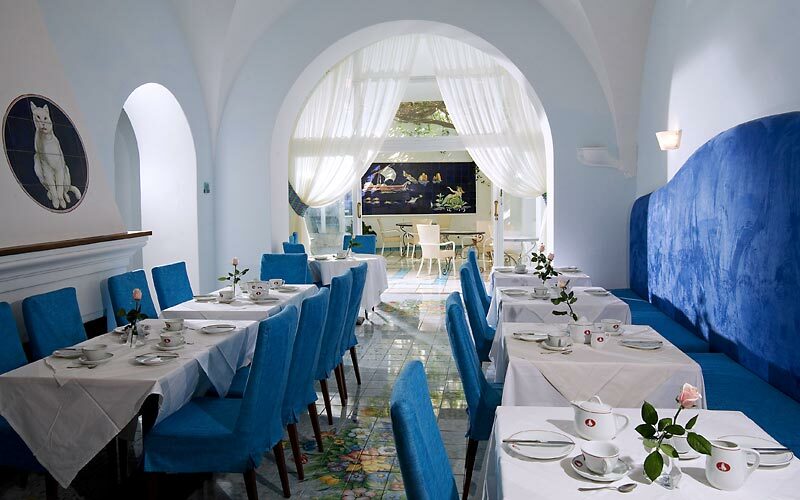 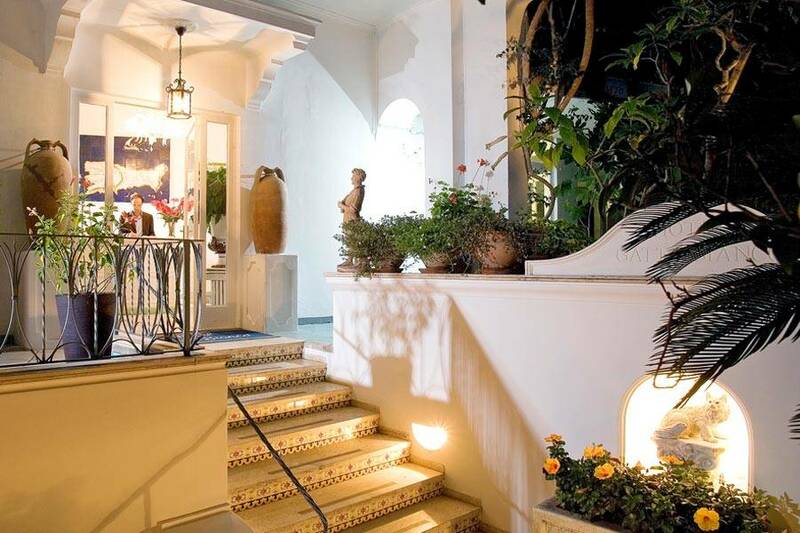 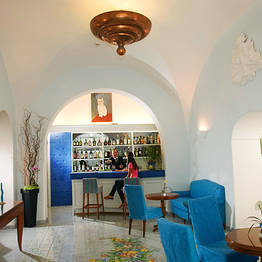 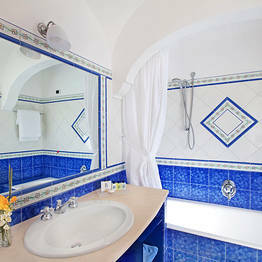 Gatto Bianco Hotel & Spa is located in Via Vittorio Emanuele, the main road in the center of Capri. 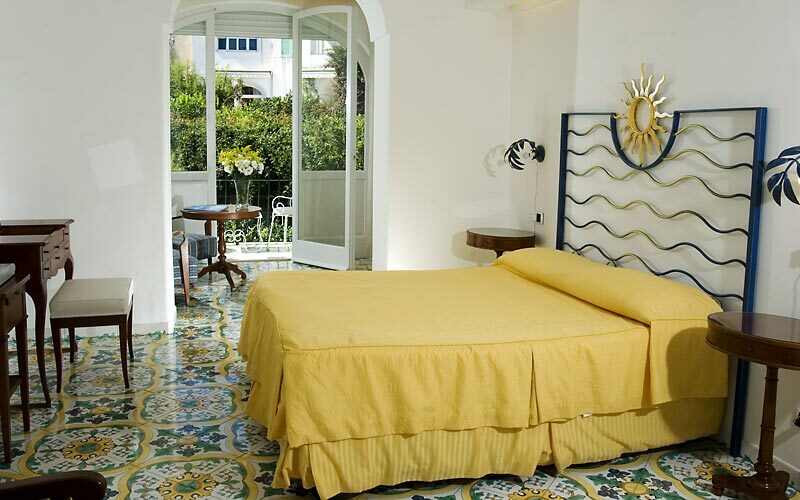 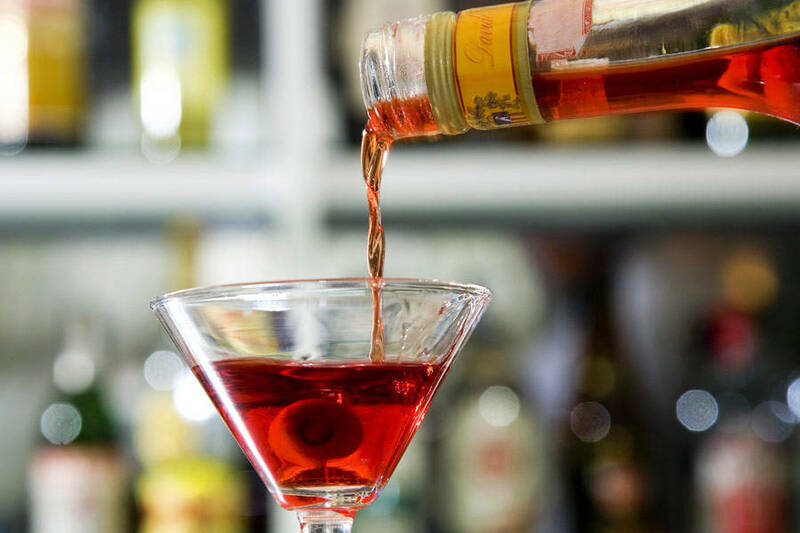 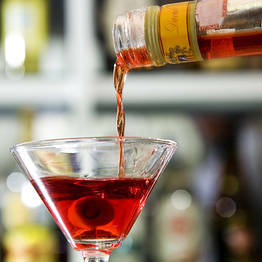 The famous Piazzetta, the heart of island social life, is just a few steps away. 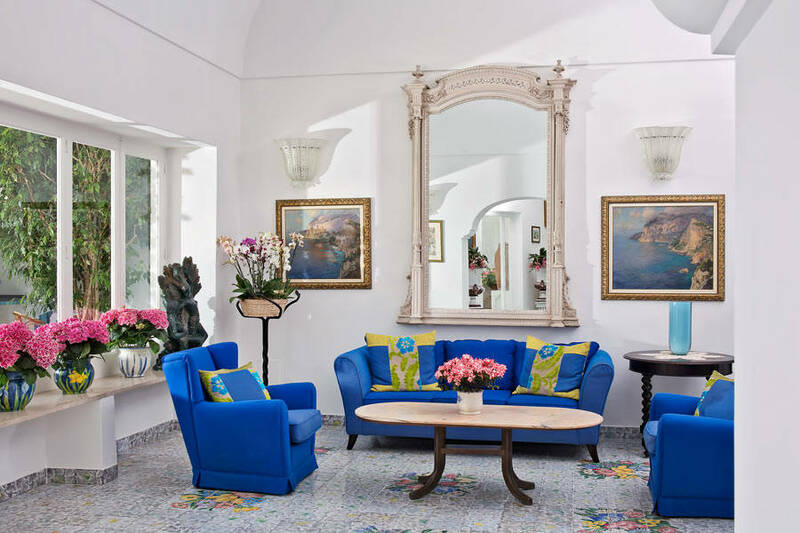 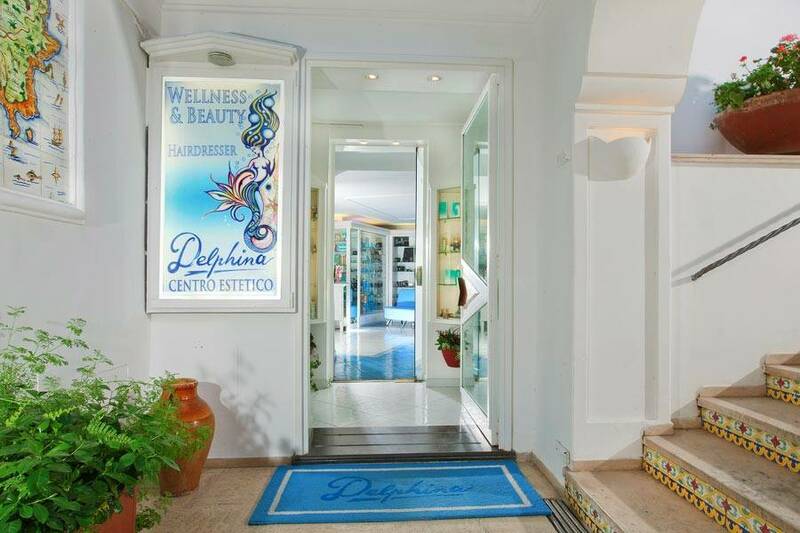 Likewise, a series of luxury boutiques, fashionable restaurants, and Capri's legendary evening venues, are all situated in the immediate vicinity of the hotel. 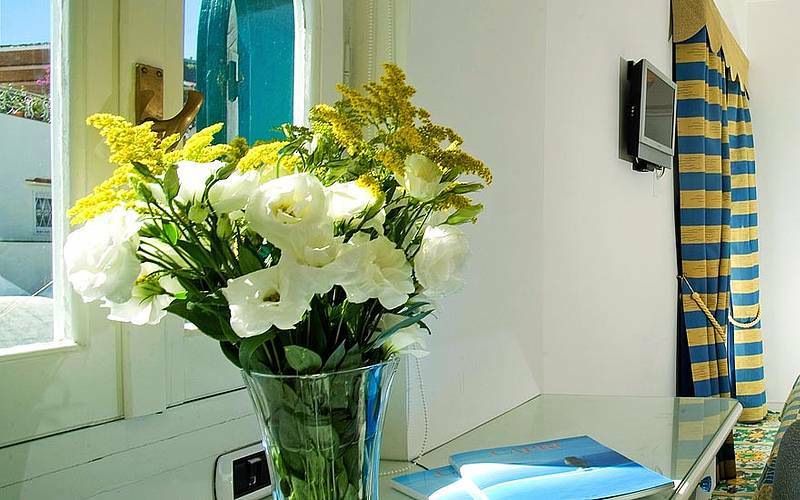 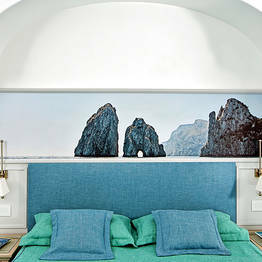 Book Hotel Gatto Bianco & Spa on Capri.net now with no additional booking fees.